Happy birthday to you, happy birthday to you…..happy birthday Veggie Girl. That’s right, yesterday was Veggie Girl’s birthday. Weeks before yesterday, I’ve been thinking of what I can give her on her birthday. You see, Veggie Girl and I have been friends since 1997. I met her when I joined the company she was working for at the time. Since then, our friendship has blossomed into something where we really don’t need to give each other presents whenever there’s an occasion. And asking each other for favors doesn’t really require a lot of formality. In fact, one of us can volunteer to do something for the other before one of us could ask for it. So what birthday present do you give a long time friend? Since we are now food bloggers, I had this idea of treating her out to whatever food of her choice, and possibly do a food review. The day before her birthday I suggested that we try one the trendy food trucks that is parked all over L.A. these days. She was cool about it until the day of. We started searching for food trucks on the internet, and overwhelmed as we both were with the variety that is out there, we just couldn’t decide which food truck to choose. Besides, most of them were nowhere close to us that day. We then quickly abandoned that idea. She had previously mentioned that she was craving Filipino food. Uh-oh, now I don’t know which Filipino restaurant to bring her to. Being Filipino, I hardly go to Filipino restaurants because I can cook Filipino food. But I must say that I was honored, happy and proud to have a non-Filipino crave our food. So think GG, think, if I’m going to take her to a Pinoy (short for Filipino) restaurant, it better be better than my own cooking, right? There’s gotta be something to it that I have not yet served to Veggie Girl. Suddenly, a light bulb moment….I remembered that a popular restaurant in Manila recently opened in L.A…..Gerry’s Grill. I’ve tried Gerry’s Grill in Manila in the past years that I’ve been going back home, and I really like it. Back to the internet, I searched for its location---Artesia, CA. Not too bad, not too far at all. The place is located inside a big plaza, so you really can’t see it from the street. From the parking lot, which it shares with other businesses, the place looks non-descript. As soon as you enter, you are greeted by a fountain wall which I thought was a very nice touch. It gives you a calming effect so different from the parking lot just right outside. The fountain wall provides a bit or privacy to the diners already in the restaurant. We were immediately greeted by the receptionist and we got seated right away. As we were both very hungry, we can’t help but dive into the menu right away. Quite an extensive menu I must say. They have descriptions of the food under each item and some of them have pictures, which I think is important. At this point, our eyes are bigger than our stomachs as everything looked good on the menu. We quickly got hold of ourselves and kept our selection down to seafood, vegetables and noodles. Noodles on your birthday is something we inherited from our Chinese influences. Noodles, long noodles in particular, are a symbol of long life, that’s why, you gotta have noodles on your birthday. So here’s what we ordered: For seafood we had, Bangus a’la Pobre and Grilled Squid. For vegetables, we had Pinakbet, and for noodles we had Pancit Palabok. 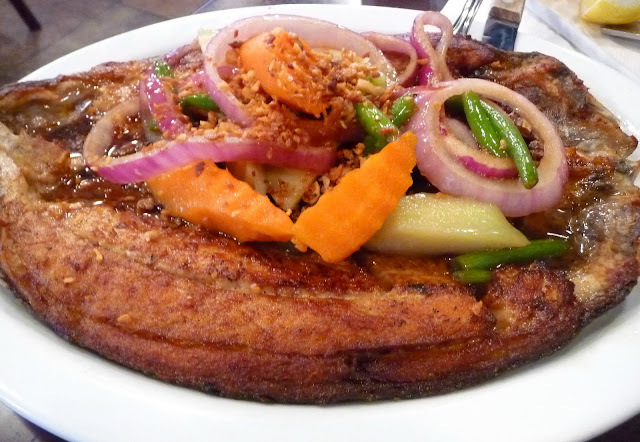 Bangus a’la Pobre – marinated milk fish, deep fried and topped with crispy fried garlic bits. First of all, the fish was deboned. Bangus has very many fine bones that you need to be an experienced fish eater to appreciate this fish. With the bones out of the way, all you gotta do is dig in. The fish is cut open on the back of the fish lengthwise and spread out like a butterfly, deep fried to perfection (where it is crisp enough but not dry), and served garnished with vegetables. I loved this! I can only imagine that the marinade was soy sauced based. How simple is that? The crispy bits of garlic on top is just the perfect finish to this dish. No need for a condiment, but if you must, try their house special dipping sauce. You don’t even have to ask for it. It’s right on every table. This dish gets a thumbs up! Bangus (milk fish) is the Philippines’ national fish. A fresh water fish that is not fishy at all. The flesh is meaty, tender, with a very mild flavor. 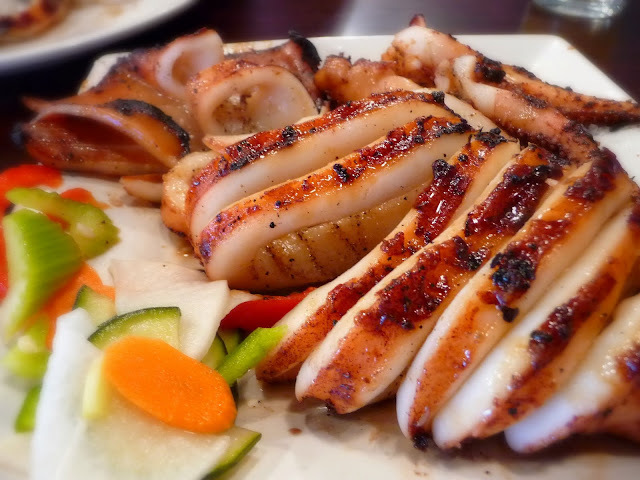 Grilled Squid – this is their claim to fame, the dish that made them famous. I will be honest, I ordered this as an afterthought. We had already turned in our menus back to the waitress when I decided to add this in, so I don’t have a description for you. I can only guess that this was also marinated or at least basted with some type of sauce while on the grill. This ain’t no measly calamari sized finger food type of squid, this was a giant squid, well, I‘m exaggerating, but it was pretty big. The meat was tender, not rubbery, and it was juicy. Another thumbs up, in my opinion. 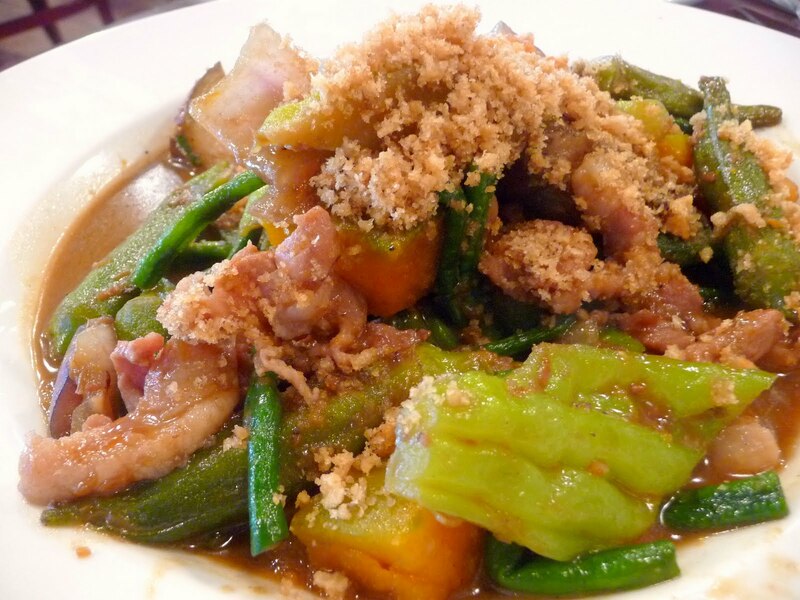 Pinakbet – a combination of different vegetables cooked in bagoong (a type of fish paste). You got everything in here: eggplant, string beans, okra, bitter melon, squash, tomatoes, and strips of pork. Finally it was served topped with ground up chicharon (deep fried pork rinds), that gave it a slight crunch. Veggie Girl obviously loves Veggies, so this is the perfect dish to order for her. I must say, up until now, I never really liked Pinakbet, but Gerry’s Grill converted me to liking this dish. While I don’t eat all the veggies mentioned above, I can just substitute it with something else. 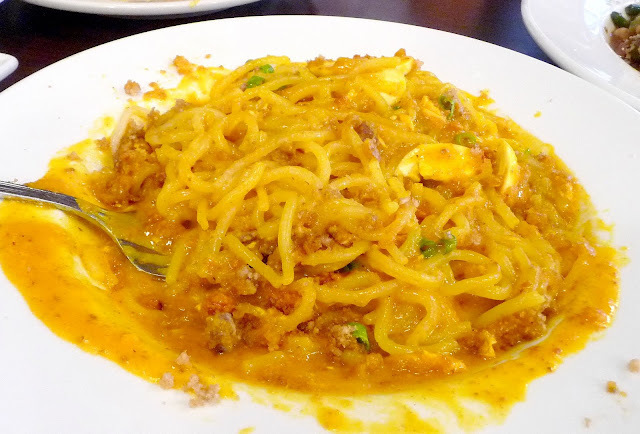 Pancit Palabok – using rice noodles with a generous sauce on top that has bits of ground pork in it. Topped with green onions, chicharon (deep fried pork rinds), and cut up hard boiled egg. Sorry, we were so eager to taste it that we forgot to take a picture before mixing it all up. This is one of my favorite dishes growing up and it remains to this day. For our drinks we ordered Calamansi Juice. Calamansi is a citrus fruit found in Asia. We use calamansi the way we use lemon here in the US. Calamansi juice is like the Philippines answer to America’s lemonade. So, will I recommend Gerry’s Grill? Yes, I highly recommend it. Is it authentic? No. I would say it is a stylized version of Filipino food. If you want authentic Filipino food, go to a Filipino mom’s or grandma’s house. In my opinion, if you want to put up an ethnic restaurant in the US that has such a diverse population, you’ve got to have an edge. You’ve got to push the envelope a little bit. And that’s what Gerry’s Grill did. It did not depart at all from the authentic version, it just gave it a little twist, just to kick it up a notch. I think there is something here for Filipinos and non-Filipinos alike. Will I be back? Absolutely! First of all, a big heartfelt thanks to Gingham Girl for such a lovely birthday gift. I think I've said this before but a gift of food is definitely my favorite kind! I thoroughly enjoyed my birthday dinner and hope to do it all over again when it's GG's birthday next and it'll be my turn to treat. Can't wait! Anyway, I'm no stranger to Pinoy food because of friends like GG who has cooked Pinoy food for me on occasion over the years. I also had another Pinoy friend who would take me to Pinoy cafeterias every so often (DJ Bibinkahan and Toto's in West Covina) but she has since moved back to the Philippines. Suffice to say, I haven't had Pinoy food in quite awhile beyond adobo and sinigang (both of which I know how to cook on my own) and pancit (which GG recently taught me). When GG asked me what I wanted to eat, you bet I was going to pick Pinoy food. I was already salivating at the thought and I figured GG would know of a good restaurant, as well as what to order. Well, she did not let me down. I really loved everything we ordered. Since I can't quite comment on its authenticity, I'm going to leave the food review portion to GG.